Vermont really knows how to deliver a romantic getaway or vacation, for a weekend or longer in the Green Mountain state. Vermont's resorts, hotels, bed and breakfast inns offer year-round luxury, fine dining, and amenities like spas and hot tubs for couples on a romantic getaway or other Vermont travel. 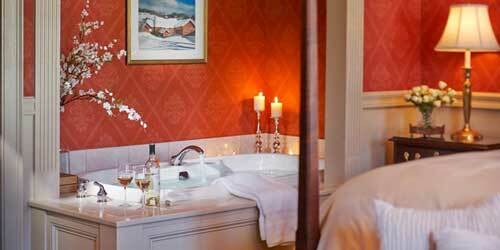 The perfect romantic getaway: A full service resort in a picture perfect Vermont small town. This premier Vermont destination has been coined "the prettiest small town in America" thanks to its nostalgic main street, rural attractions and untouched panoramas. Escape the hustle and bustle and retreat to one of our luxurious rooms, energize at our fitness center, relax at our spa and dine at our four star restaurant. Each of our 142 renovated rooms and suites are redesigned to showcase Vermont's natural spirit, featuring wood-beam bed frames, light to neutral decor and organic bath products. Regional artwork adorns the walls, custom Vermont-crafted furniture fills the hotel and, in select rooms, working fireplaces provide a romantic ambiance. White-tiled bathrooms feature oversized shower heads to keep you pampered for your entire stay. Spend your romantic vacation in luxury. 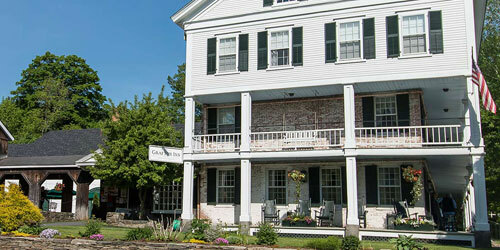 The Grafton Inn is on the National Register of Historic Places. Opened in 1801, the Inn has hosted presidents and literary luminaries like Nathaniel Hawthorne, Ralph Waldo Emerson, Henry David Thoreau and Rudyard Kipling. Cozy and scenic Grafton, Vermont has been restored to its pre-civil war finery and simple pleasures to reflect New England as it once was. Stay in the Main Tavern, cottages or one of five guest houses and fill your day with yoga, massage and the fitness center, while in room you’ll enjoy private bath and complimentary WiFi. Savor delicious in-house dining at the Old Tavern Restaurant and the Phelps Barn bar and pub. You’re near great shopping, sightseeing and the areas major attractions and recreational activities. 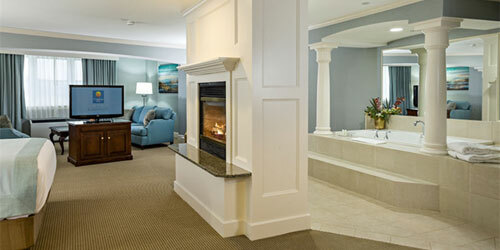 Luxury reigns supreme here at our elegant, full-service Vermont resort; our goal is to pamper and sooth. 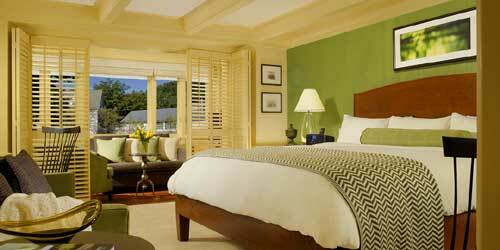 Discerning travelers will feel pampered in the 10 Castle Hill rooms which blend classic elegance with modern technology. Guests may also opt for our Resort Homes which feature magnificent views, elegantly appointed accommodations, state-of-the-art amenities, and are quite spacious, providing more room to relax. Our Aveda Concept Spa offers soothing treatments and services. Your dining experience will be a gourmet feast for the eyes as well as the palate! French-influenced American cuisine will delight your taste buds for breakfast and dinner. Chef Alphonsus Harris focuses on using local, fresh produce and quality meats on the prix fixe, four-course dinner menu, which changes seasonally. 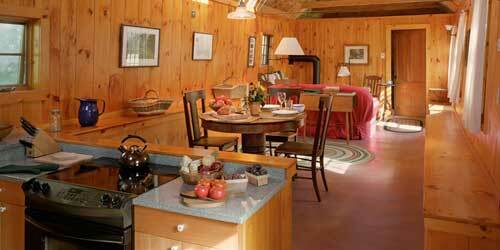 Escape to northern Vermont and Sterling Ridge Log Cabins on 350 private, wooded acres. Fulfill your dream of peace and tranquility with your very own log cabin with covered porch and Adirondack chairs. 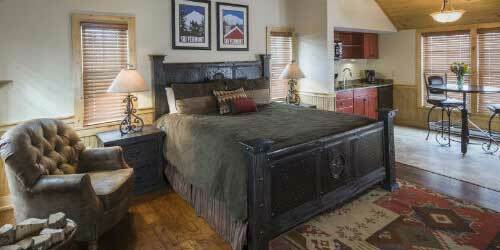 Modern amenities include a fully equipped kitchen, Jacuzzi tub, wood-burning stove, cable TV and Wi-fi. Experience long strolls through our wooded trails or the nearby Lamoille Valley Rail Trail. Check out the local scene by visiting one of the many breweries, distilleries or wineries. Sample artisanal foods and wares at a farmers’ market, go antiquing in one of the many quaint Vermont villages or try an adventure with Vermont Canoe & Kayak. 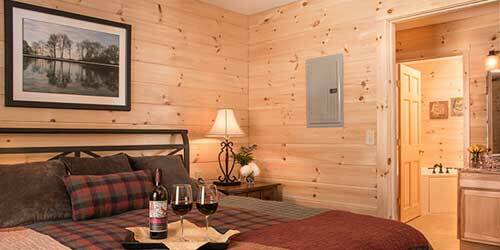 Sterling Ridge Log Cabins is a perfect, romantic getaway for couples to unwind, relax and enjoy each other’s company. 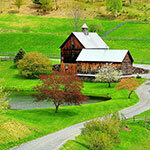 The natural beauty of Vermont makes it easy for romance to keep on blooming. If you are looking for a quiet getaway of simple pleasures, you’ll find a sweet corner at Hobble Inn, a cozy bed-and-breakfast in a residential area of beautiful Stowe. Innkeeper Mary Skelton has restored this family home into a pleasant inn with warm guest rooms and common areas, including a sun room where you can sit and watch the snow fall or the spring greenery rise. A hearty breakfast gets you fueled for mountain walks or bicycling, fishing or paddling, or snow sports in winter. Tenderfoots and indoor people can shop to their heart’s content in many interesting stores. 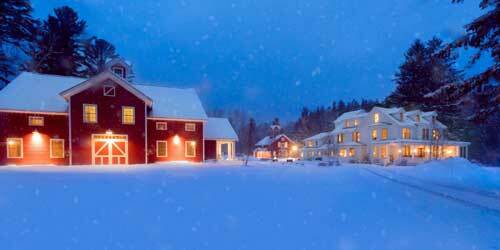 Out on the town or at the inn, you won’t lack for genuine Vermont hospitality. Stone Hill Inn in Stowe, Vermont, is a welcoming place to catch your breath, where couples can take some time to celebrate life together. 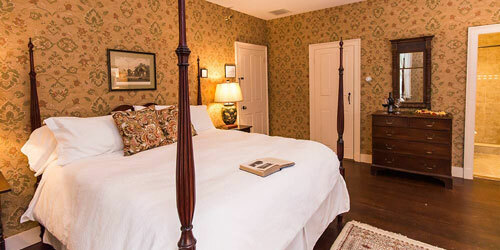 Our luxury bed and breakfast offers king-size beds, double Jacuzzis, and fireplaces in every room. Enjoy breakfast in a sunlit dining room with 40 windows and a 14-foot ceiling. We're just a short drive from downtown Stowe, with its many shops and great restaurants. Our area offers year-round recreation. In warmer months discover ballooning, kayaking, ziplining, white water rafting, and fall foliage. In winter months enjoy world-class skiing and snowboarding on Mount Mansfield, just minutes away. Go dashing through the snow on a 30-minute sleigh ride. From the moment you step into the chandelier-lit, flower-decked lobby of the Comfort Inn & Suites Near Burke Mountain, you will feel like you have found a place that treasures romance. 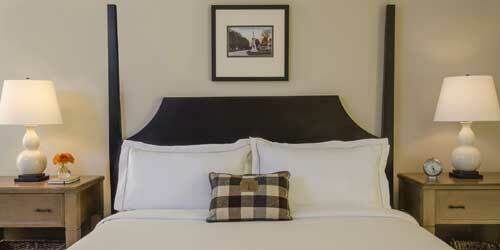 Cozy rooms and suites – packed with amenities – are very affordable. The grand Presidential Suite, for instance, spoils couples on a romantic getaway with four-post king bed, two-sided fireplace, and Roman whirlpool tub. From the Inn’s landscaped sun deck, you can gaze at the magnificent mountains of the Northeast Kingdom, arrayed in deep green in summer, gold in fall, and sparking white powder in winter. Dive into the region’s year-round outdoor sports; explore museums and antique shops; or stay close to the Inn and roost in the indoor heated pool or whirlpool. Take a break from everyday stress with a weekend getaway to Vermont's Golden Eagle Resort, a country inn nestled in the mountains surrounding rustic Stowe. Wildlife love our ponds and grounds. Explore, and you may spy deer, ducks, great blue herons and occasionally a wandering moose. The Stowe area is filled with fun things to do, too. Ride the gondola up Stowe Mountain. Tour Ben & Jerry's Factory, and sample their delicious wares. In winter hit the slopes. When you're finished with those activities, return to our resort for the ultimate in relaxation. Enjoy a Swedish couples massage in our tranquil spa suites. Splash in our large heated indoor pool, or let yourself melt away in our hot tub or cedar sauna. 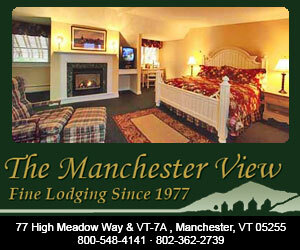 No matter which season you plan your visit, the hills of Vermont are the most romantic place in New England, and The Manchester View is one of the most romantic inns there. Our property sits high up on a hill just a mile and half north of the center of Manchester Village. 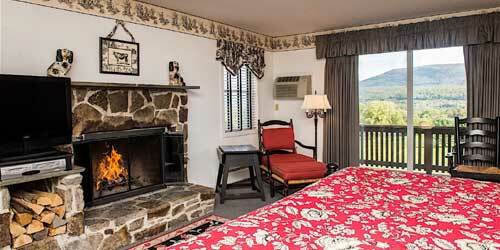 You can enjoy crackling fireplaces, two-person spa tubs, and mountain views from your bed. Come in the winter and the two of you can enjoy skiing at several nearby top resorts, including Bromley and Stratton. In warmer months our guests are given entree to Manchester Country Club, just a quarter mile away, for golf and tennis. Choose our romance package and find a bottle of chilled champagne and gourmet chocolates in your room upon arrival. Located in two distinctly beautiful parts of Vermont, superior hospitality is the hallmark of both the Rabbit Hill Inn and Vermont’s Grafton Inn. Among New England’s original stage coach inns, the circa 1801 Grafton Inn offers 45 guest rooms, each offering a distinctly different setting for everyone from honeymooners to families. Nearby Grafton Ponds offers up mountain and fat biking trails, XC skiing and snowshoeing and tons of outdoor adventure. Rabbit Hill Inn in Vermont’s Northeast Kingdom sits on 15 acres with scenic views toward New Hampshire’s White Mountains. Here, luxurious rooms, fabulous breakfasts and fine dining cuisine at dinner are served in a fireside dining room. Enjoy a drink first in the cozy Snooty Fox Pub. 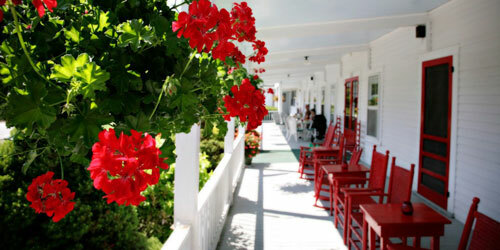 Romantic getaway packages offer adventures and fine dining. 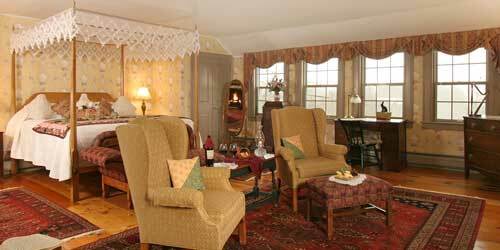 Why rent a room for your romantic getaway when you can rent a cozy sugarhouse? Looking for the perfect romantic getaway? 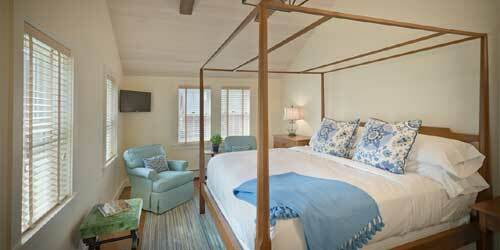 Come rent one of the many lovingly restored properties of The Landmark Trust USA. There is the sweet Sugarhouse perfect for two next door to the Scott Farm Orchard, where you can take a hike on the farm’s scenic trails or shop at the farmstand for heirloom apples in fall. Other Landmark Trust USA properties available are two comfortable farmhouses, a restored carriage house and the majestic home of Rudyard Kipling, where he wrote “The Jungle Book.” Nearby are restaurants, art galleries and world-renowned summer music festivals. Head to Manchester, Vermont, for your next romantic getaway, and stay at the newly-opened Taconic, where luxury will surround you. Taconic is a Kimpton-managed hotel, which means dining is a memorable experience. We serve farm-fresh cuisine that reflects New England's culinary heritage. The centerpiece of our restaurant is a double-sided fireplace that encourages lingering. Enjoy thoughtful perks and amenities, including yoga mats in every room, complimentary coffee and tea to start the day, hosted evening Social Hour, in-room fitness programming, and complimentary bike rentals. Taconic is year-round destination. We're close to two ski resorts, Bromley and Stratton. In warmer months enjoy hiking, boating, fly fishing, mountain biking, and more. In fall the brilliant foliage is unforgettable. Spend time with that special person in your life by sharing the romance of The Mountain Top Inn & Resort's Romantic Getaway, available year round. Varying seasonally, this intimate package includes luxurious lodging, country breakfast, a candlelit dinner, welcome truffles, use of many of the Resort’s facilities and much more. 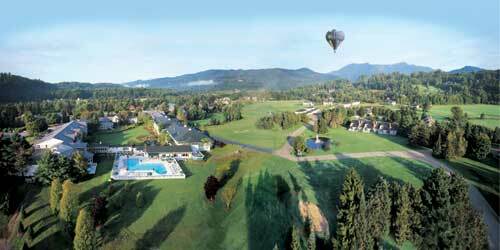 The classic mountain resort is located in Central Vermont, a short drive from Killington and Rutland. Majestically set on 350 acres in the lush Green Mountains with spectacular views of a sparkling lake and majestic mountains, the Resort offers privacy and relaxation for couples… and the perfect spot to propose. 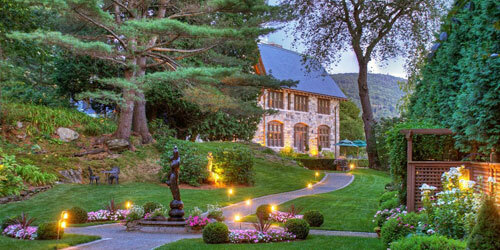 What could be more romantic than a Vermont inn tucked into the heart of a charming village? 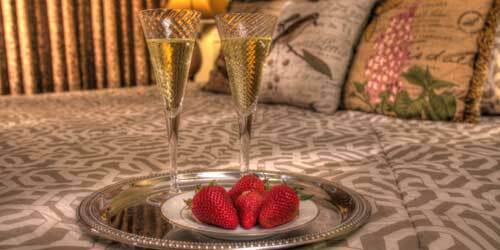 Take advantage of the Heart of Stowe Romance Package at the Green Mountain Inn and you’ll be greeted in your cozy room (or spacious apartment) with champagne and chocolate-dipped strawberries. (There’s also a coupon to a local jeweler, not that we’re hinting.) Take a dip in the pool, get a massage at the spa, stroll along Stowe’s main streets seeking Vermont crafts or antiques. Talk to the concierge about arranging a sleigh ride or a ride in a hot-air balloon! 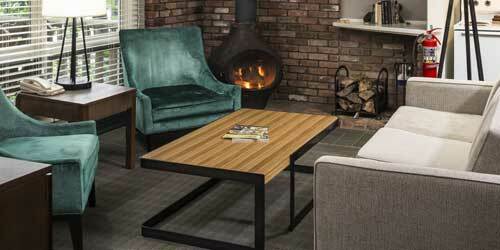 Enjoy fine dining in the Whip Bar and Grill, then adjourn to your room, suite or apartment to enjoy a fireside Jacuzzi. A shimmering lake with a Green Mountains backdrop, a dock with rowboats and canoe, and cozy lodgings for two welcome you to this romantic and historic inn built along an old stagecoach line. 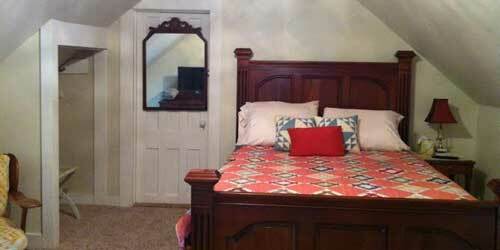 Rooms and condos offer antique touches, some with fireplace and Jacuzzi, and king or queen size bed. Across the street, a white steepled church adds further New England character and charm to your intimate getaway. Refresh yourselves in the hot tub and pool. Play a set of tennis or head to Okemo just minutes away for day of skiing. There’s hiking, biking and horseback riding nearby too. Great food and excellent service can be found in the restaurant recently featured in both Gourmet and Bon Appetite magazines. Rabbit Hill Inn is the perfect place for the two of you to escape into the serenity of the White Mountains and Vermont’s Northeast Kingdom, surrounded by gardens and wooded walking trails. Your romantic room or suite might include a canopy bed, fireplace or a whirlpool tub for two (imagine the room lit by candles). Some have porches or sun decks. The Romantic Getaway Add-on Package includes sparkling wine and fine Vermont chocolates and an intimate three-course dinner for two. “Do Not Disturb” packages include a bountiful candlelit breakfast, in-room massages and roses. Fine dining is also yours, complete with flickering candles, music, attentive service -- and a sophisticated menu. Rated #30 of the Top 100 Hotels Worldwide, #6 in the USA, and #2 in the Northeast by Travel & Leisure, July 2017. A place for Romance! A place for Fun! Love is in the air and the beautiful view of the Mount Ascutney is awaiting your arrival. Holiday Inn Club Vacations Mount Ascutney Resort is a quiet romantic resort that invites blissful romance and relaxation. Settle into spacious villa-style accommodations with fully equipped kitchens and electric fireplaces in the living area. Enjoy the day playing tennis, swimming in the indoor pool or exploring the countryside. Then, enjoy a romantic dinner at The Maple Kitchen, the on-site restaurant that serves up fresh local farm-to-table ingredients, craft beer and spirits for a true taste of Vermont. 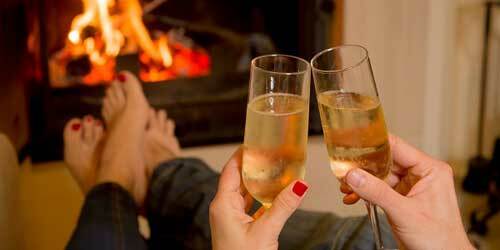 Afterwards, cozy up and toast to the perfect romantic getaway. Elegance will surround you when you spend a night at The Reluctant Panther, a boutique inn in historic Manchester, Vermont. Our 20 guestrooms and suites demonstrate the attention to detail that will help create a special romantic vacation, or just a weekend getaway – comfortable furnishings featuring traditional New England and modern style elements, luxurious baths and cozy fireplaces. Combine that with superb fine dining at our award-winning restaurant, and attentive and personable service. Make the most of our cuisine with our excellent Epicurean Package, tee up at local golf courses with our Golf Getaway Package, or our ‘Shop ‘til you Drop’ Package and enjoy a bit of local retail therapy. The wonderful array of Manchester’s outdoor and cultural activities await you just outside our doorstep. Settle in any time of year on fifty acres of pristine meadowlands and valley with enough country comforts and serenity to soothe and recharge you both. This classic Vermont bed and breakfast getaway offers rooms and suites with stunning views and private baths. You also find separate sitting rooms, gas stoves, flat screen TV’s, complimentary Wi-Fi, down pillows and comforters with luxurious linens. Start your day with a bountiful breakfast included in your stay. Then head out for nearby Manchester for world-class shopping, dining and cultural sites. Four season outdoor recreation awaits with hiking, biking, skiing and canoeing and much more. Or simply relax poolside, in the pub, or on the porch for some unlimited hand holding, eye gazing and smooching. Step into a one of a kind romantic experience surrounded by majestic mountains, gardens and panoramic vistas. Choose from a comfortable guestroom or luxurious suite graciously appointed with handsome furnishing and superb amenities like warmly lit gas fireplaces, soothing Jacuzzi tubs, refrigerators and wet bars, cozy bedding, spa bathrobes, complimentary WI-FI, HD flat screen TVs, Keurig coffeemakers and more. Enjoy the state-of-the-art fitness facilities, an award-winning restaurant, and the 50,000 square foot, world-class spa, offering more than 120 soothing Signature treatments. Lounges, steam room, a sauna, and a juice bar. 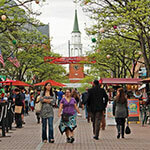 You’re within walking distance of Historic Stowe village with its quaint shops, restaurants and entertainment. The Stowe ski area is a quick shuttle-ride from the resort.